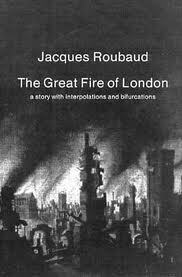 The latest addition to my website is Jacques Roubaud‘s Le Grand Incendie de Londres (The Great Fire of London). I have mentioned before that one of the minor pleasures of reading novels is to find strange similarities between two books read consecutively. I first noticed this when, many years ago, I was travelling to work with a friend and we both happened to be reading books featuring spontaneous combustion. I was reading Bleak House and he was reading Madison Smartt Bell‘s Waiting for the End of the World. While there is little similar between this book and the last book I read, Efraim Medina Reyes: Técnicas de masturbación entre Batman y Robin [Techniques of Masturbation between Batman and Robin], both have titles which are almost entirely irrelevant to their books and both are about an attempt but ultimate failure to write a novel, though ending up with the novel we are reading. You will notice from the cover photos – the French edition top left and the English one to the right – that they feature the Great Fire of London. Clearly the cover designers in both cases had not read the book because, whatever it is about, it is not about the Great Fire of London. In fact, if we wish to sum up it simply, it is about an attempt to write a novel called The Great Fire of London which fails. Roubaud had had a dream nineteen years previously which involved him coming out of a London tube station and that he was about to have a new start in life. When he awoke, he knew that he would write novel called The Great Fire of London. This dream and the death of his wife, Alix, are what led him to write this book but not the book he was going to write, which he could not write. The book describes, in great and often boring detail, his post-Alix writing life, his struggle with this book and his various ideas about writing, as well as his own life – his childhood, his married life, his love of poetry, his travels. It is a clever and interesting idea, though we know that he is not going to write The Great Fire of London because he tells us so at the beginning, but it is not a particularly easy read. However, I am glad to have read it, as it gives a perspective on the writing life and inner life of a writer that we do not normally get to see. And it is a lot better book than Efraim Medina Reyes: Técnicas de masturbación entre Batman y Robin [Techniques of Masturbation between Batman and Robin].